August 2011 issue on sale now! | What Hi-Fi? 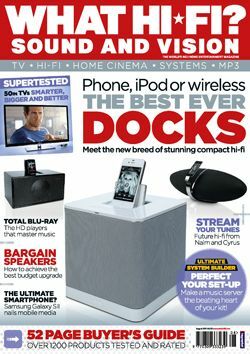 August 2011 issue on sale now! Are iPod docks the new breed of compact hi-fi? That's the question we ask ourselves in the August issue of What Hi-Fi? Sound and Vision, on sale today. Five premium docks go head-to-head in our Group Test: last year's Award-winning Arcam rDock, B&W's brand-new Zeppelin Air, the Bose SoundDock 10 (which has had a price cut), Geneva's Model M and the Philips Fidelio Primo DS9010. Has the Arcam rDock finally met its match? All is revealed. It's not only docks that are reshaping the face of hi-fi: audio streaming is all the rage, and we've got our hands on two all-in-one streaming systems, the new Cyrus Streamline vs Naim's UnitiQute. And in The Big Question we ask three readers: "Does music streaming sound the death knell for the CD player?" If you need a pair of budget speakers to give your existing hi-fi a boost, we test four budget models (£180-£210) from Acoustic Energy, Boston Acoustics, Dali and Mission. At the other end of the price spectrum, our Temptation section this month features top-of-the-range speakers from Tannoy, PMC and Analysis Audio. Switching to home cinema (but still with a musical theme), we've finally managed to group together four premium Blu-ray players that promise superb movie and music playback. So Arcam's BDP100 takes on Cambridge Audio's 751BD, Marantz's UD7006 and Oppo's BDP-95EU. Find out which one gets our vote. And in this month's Supertest we pit six large, 50-5in smart 3D TVs against each other, with prices starting from just £710. That's amazing value. Finally, we've got 11-pages of First Tests, packed with the hottest new kit, including Sony's flagship KDL-46HX923 3D internet TV, Cambridge Audio's NP30 network streamer, Samsung's Galaxy S II smartphone, Sony's BDP-S780 Blu-ray player and Panasonic's DMR-BWT700 Blu-ray recorder. All this and more is in the August issue of What Hi-Fi? Sound and Vision, on sale now. And don't forget you can download our digital edition for just £2.99 + VAT.